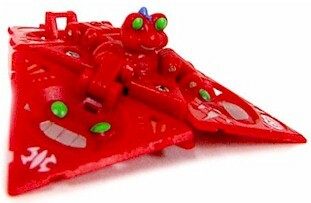 Tripod Epsilon is Marucho's frog-like Bakugan Trap, and takes the shape of a three-sided pyramid when closed in Trap form. Tripod Epsilon is a Bakugan Trap who joins forces with Elfin to battle Vexos. It can cover great distances in a single leap and has the ability to blend into its surroundings, making it virtually invisible. Tripod Epsilon uses its dark red eyes to control an opponent's action. It can use Aquos, Haos, and Subterra abilities. It also holds a huge leaf with the snail as the abilities. Purchase Season 2 Tripod Epsilon Trap from Amazon now!